Τοποθετημένο στην υπέροχη περιοχή της Τεκάντι, το Amaana Plantations Resort χαίρει μιας επιβλητικής θέσης στη οικογενειακή διασκέδαση, περιήγηση σε αξιοθέατα κεντρικό σημείο της Τεκάντυ. Από εδώ, οι επισκέπτες μπορούν να έχουν άμεση πρόσβαση σε όλα όσα η πόλη έχει να προσφέρει. Με την βολική του τοποθεσία, το ξενοδοχείο προσφέρει εύκολη πρόσβαση στους προορισμούς της πόλης που πρέπει οπωσδήποτε να δείτε. Στο Amaana Plantations Resort, πραγματοποιείται κάθε προσπάθεια για να αισθανθούν άνετα οι επισκέπτες. Για να το πετύχει αυτό, το ξενοδοχείο προσφέρει τις καλύτερες υπηρεσίες και ανέσεις. Κατά την διαμονή σας σε αυτό το υπέροχο ξενοδοχείο, μπορείτε να απολαύσετε τα δωρεάν WiFi σε όλα τα δωμάτια, 24ωρη φύλαξη, ημερήσιος καθαρισμός, τζάκι, υπηρεσία ταξί. Το Amaana Plantations Resort διαθέτει 5 δωμάτια. Όλα τους είναι διακοσμημένα με γούστο και πολλά από αυτά παρέχουν ανέσεις όπως επίπεδη τηλεόραση, πετσέτες, ντουλάπα, σύνδεση internet (ασύρματη), ασύρματη σύνδεση internet (δωρεάν). Το ξενοδοχείο προσφέρει υπέροχες ψυχαγωγικές εγκαταστάσεις όπως οι γήπεδο μπάντμιντον, πλοία, ψάρεμα, παιδική χαρά, κήπος για να είναι η διαμονή σας αξέχαστη. Όποιος κι αν είναι ο σκοπός της επίσκεψης σας στη Τεκάντυ, το Amaana Plantations Resort είναι μια εξαιρετική επιλογή για μια χαρούμενη και συναρπαστική απόδραση. The resort is well located and designed giving guests an amazing view of the spice plantation. My husband and I were fortunate enough to meet the owner (Didy) who was very nice and showed us around the plantation. The rooms were of a very high standard, the food was great and the staff were great too! Special thanks to the manager at the restaurant who really looked after all our meals. We will definitely visit again and would recommend to guests going to Thekkady as it is close distance to Periyar Tiger Reserve and the venue for the famous Martial Arts show. Staff went an extra mile to please us. They managed to arrange birthday cake and fresh flowers at a short notice. The food was nostalgic and we could take long walks and even trek at the mountains, which is actually quite easy to climb if you’re up for it! Amaana Resort is a amazing place and very nice locations,surrounding green,we were in a big plantation. Especially staffs are very friendly and helpful even their owner too. He is very nice gentleman,he take care of his guest as own guest,privetly met them and ask their satisfaction. We were really enjoy,next time we will go there. A relatively new resort nestled in a cardamom and pepper plantation. There are only around 8 or 9 cottages, so it feels rather cosy. The rooms and facilities are very clean and the staff are friendly. You can go for fishing in their pond or have a bbq night. We didn’t do any of these, but took a little walk in their plantation. We truly enjoyed our time at this resort. The staff of this property is one of the best we have come across ( we do two vacations in a year). Foodies will have a great time, freshly made everytime. The “phulka’s” are truly “phoola hua” on the table (rarity at home too these days!!!). An absolutely satisfying experience. Different than regular hotels which has lot of guests. There are only few rooms right in the mid of the spice (cardamon and pepper) and you get personalized attention. Rooms/villas are perfect, clean, classy, spacious and comfortable. We stayed for couple of days here and we had the best experience during our Kerela tour. You can do plenty of things in the Resort itself including spice garden visit, fishing, bbq, etc. Thank you chef and hotel staffs for arranging the beautiful table for our wedding anniversary eve. Food was excellent and the staff special care to make dish to suite your taste. Also thanks for the fresh jackfruit :) . I was lovely. Amaana Plantation was our favourite place to stay in our month of travel in Kerala. Set within a cardamom plantation and gorgeous gardens, this was a tranquil place to settle each evening. The private chalets are gorgeous, comfortable and clean. And, the intimate dining room and fantastic chef made for memorable meals. All of the staff were incredibly hospitable, sincerely interested in your experiences and wellbeing, and hard working. 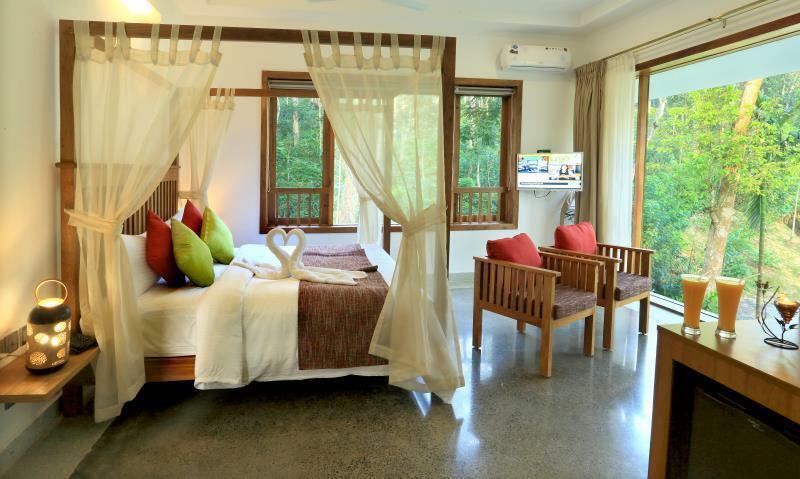 We strongly recommend Amaana Plantation. This is a new hotel with 5 star facilities and great food. Only negative is it is next to a busy road and 5 Km from main park. Though the property houses only 5 Villas, the huge greenery makes your entire experience a much needed rejuvenating trip. We travelled with 2 kids (11 and 5) and stayed in the property for 2 nights. Honestly speaking, except for the Periyar boat ride (not worth the money), we spent entire time in the resort. The trekking inside the cardamom plantation was a highlight, with my kids having a great experience. The food was good and the hospitality was great. Anyone going for a rejuvenation trip should try Amana Platation resort. Though the price was on the higher side, still we had a great trip with no regrets. Very good location easy to find and has some good facilities. Had a good breakfast but dinner what we ordered was not good. Very helpful staff. Rooms are quite big. Amaana Resort has completely bowled us with it's property, it's facility, lovely food and efficient and friendly staff. It definitely exceeds ones expectations, especially if you want to experience nature all around you. It's beautiful and green, has it's own private lake and the rooms are spacious, equipped with all modern amenities one can think of. Because it has only 5 rooms, it does give you a private experience, since the occupancy at any given time will be lesser compared to many hotels in the area. The food is very good and they have a good variety of options for kids to older adults. The staff is very friendly, courteous and helpful, taking care of all our needs and comfort. The view from every room is breathtaking. It's a place which needs to be experienced coz words don't do justice to it! A must must visit for all!! Right from the time we got into the property till the time we departed, we savored every moment given the excellent maintenance and upkeep of the property, the express service for every thing and the ever smiling and extremely courteous staff. The chef deserves a special mention not only for the flavors that he created but the amazing speed and the presentation of each and every dish ordered. This property is not only highly recommended but is a MUST to stay at while at Thekaddy. Plantation tour was really interesting. Staff was very friendly, food was amazing too. Quiet location, very personal experience.